Truck bed drawers are an ideal storage system for a very wide range of professions; they allow any crew to easily organize and access the gear needed to do the job. This also protects valuable materials, tools and parts from weather conditions, corrosion, scratches or damage. A truck bed storage system increases efficiency of on-call services and field work, allowing crews to operate with greater ease and safety. It also provides increased storage capability to any service truck, allowing your enterprise to keep more replacement parts, materials and specialized tools to meet diverse challenges. Additional features like partitions, boards, and work stations can be adapted to the system to make field work even easier. High quality D&R truck bed drawers are durable and practical, custom fabricated with a combination of modern materials such as quality metals and plastics. They provide convenience and will make any service vehicle more useful and valuable. 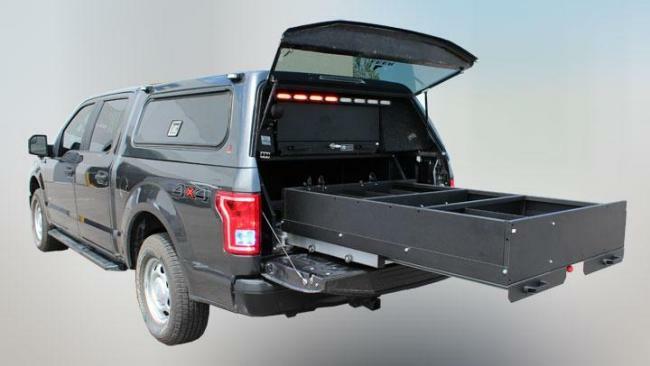 Truck bed drawers increase your cargo options while ensuring the safely and stability of the vehicle. With different options and designs providing a single or multiple drawer system, they can be custom built and installed to fit your vehicle, keeping the truck bed itself from getting scratched or damaged. These organization systems are heavy duty and can hold a significant amount of weight. With expert installation and customization, your service truck will increase productivity and make work easier for staff. At D&R, we specialize in custom storage systems for trucks, pickups and SUVS that make organization and efficiency easily manageable. With extensive technical experience and modern capabilities, we work closely with your enterprise to design a customized solution that maximizes efficiency and meet your specific needs. Contact D&R Truck-Stor today to speak with an expert technician about customized truck bed drawers and storage solutions, or visit us to see our modern facility.